Community: Negril Chamber of Com. island-style un-commercial Caribbean beachfront vacation. 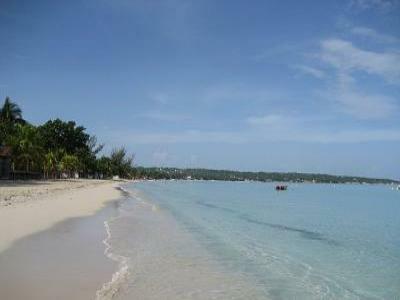 of the beach, where you can easily walk to all Negril's attractions. in each of the other bedrooms. Daily maid service is included in the rates. size bed & private verandas overlooking the beach. entertainment are easily arranged by request to our manager. reasonable rates.....they check with you each day if asked. that Negril is so justly famous for. sunset till sunrise while you sleep. all watersports, shopping trips & tours to the country. gathering spot for Nirvana guests to meet & share conversation. Cottage 1 has three bedrooms and accommodates six people. bathroom with an open-tiled shower right outside. the cottage, and another full bathroom just outside. Cottages 3, & 4 can each accommodate four people. inside, and a lovely open family room/kitchen. bathroom, spacious living/dining area, and full kitchen. It is our only unit designed with handicapped access. two guests in all cottages. features a large open sun deck with total privacy from any neighbors. fridge in the room,The ocean view is breathtaking, and it's all yours! suites inall of Negril.........you will fall in love with them. 10% gratuity for the staff tip pool as your only tip, to all rentals. Roll-a-way beds are available in any unit to accommodate extras. All deposits received will be confirmed by email or regular mail. refundable if Nirvana is notified 60 days prior to arrival. refundable unless we can re-rent the space.